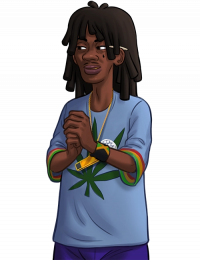 Tyrone is a African American teen, with black dreads and brown eyes. He wears a blue shirt with a cannabis leaf logo, and teal, baggy shorts. Similar to his gang, he raps. He's mostly seen with Eve, Chico an Chad at night at the park. This page was last edited on 2 April 2019, at 00:45.